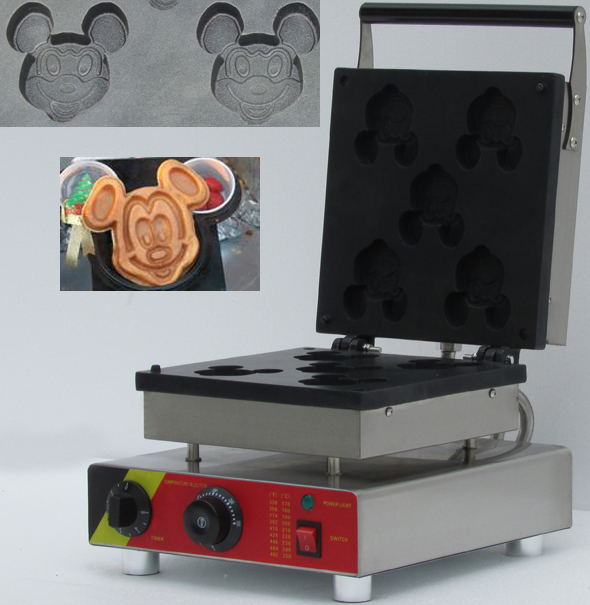 Cartoon Mickey mouse shape waffle mould design, 5 pcs funny cartoon waffle moulds. Commercial use design, professional, more durable and more efficient than small household machines. Non-stick Teflon cooking surface waffle molds. This product designed with stainless steel, the luxurious appearance design,whole structure security reasonable. Baking waffle with independent heat control and aluminum molds with high thermal conductivity. Stainless steel furnace body with heat-insulated handle. Adjustable thermostat,from 50 to 300 degree centigrade. With timer control and automatic mode, 3-5minutes to done, easy to operate and clean. With the advantages of clean, sanitation, easy operation and power saving. This product is very suitable to bake food in the shop/fields and to provide hot food to the customer. It can be widely used in organization, school, restaurant, cafeteria processing departments and individual restaurants, for making yummy cartoon waffle.